Stan Shellabarger is an artist who walks or, rather, he is a walking artist—that is, walking is his art. He records his walking activities not with pen and map nor strewn breadcrumbs, but by attaching graphite or sandpaper to his soles and making contact with paper laid down in his path. He follows a planned route, albeit a brief one: a staircase, or a stretch of sidewalk. Back-and-forth repetition is key. 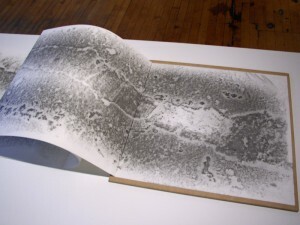 The resulting paper reveals either a smeary frottage of silvery graphite or a patterned tread of holes, depending on which implement Shellabarger wears on his feet. The paper is proof of contact with the world. “The passage of a life should show; it should abrade,” writes poet Kay Ryan, who imagines a fictive world wherein the things we touch daily reduce in matter from persistent friction, and paths commonly taken are susceptible to wear from their walkers. The resolution of the poem is, discerningly, “things shouldn’t be so hard.” In Ryan’s tender words, life is too resistant for flesh already so yielding. But the opposite is true; we do grind down our environment. That Ryan wistfully imagines respite from so much exterior gnawing reveals a hypersensitive temperament, one both empathic and self-effacing. Is this the perception—or sensation—of the artist? That life imprints its marks on our bodies? That it would be a relief to push back? This is what historian Stephan Bann calls an “existential trace,” where life is measured by aftereffects, marks, and residues—say, a stain or a footprint.